Nail head calcite with quartz from the LaFarge Quarry, Ravina, NY. 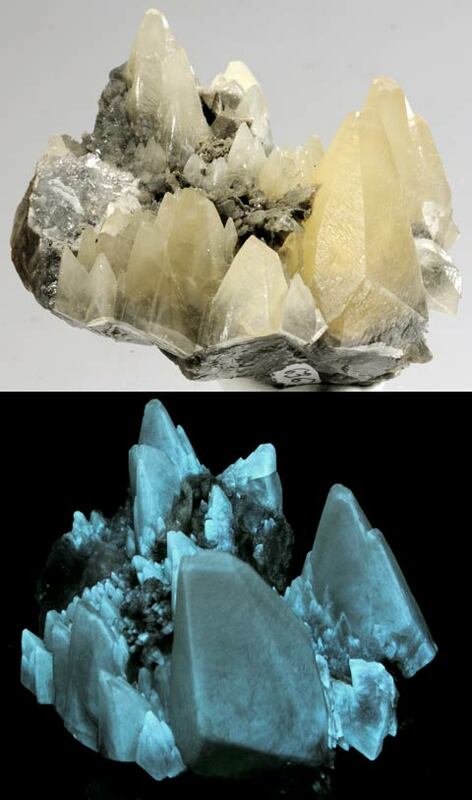 The crystals fluoresces pale gray SW. The piece is 9.0 oz and 3.3 x 2.5 x 1.8 inches. Beautiful crystals of natrolite with a cluster of calcite crystals on top from the Poudrette Quarry, MSH, Quebec, Canada. Found in June, 2004. 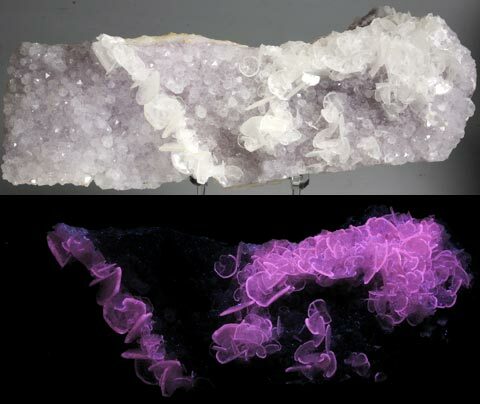 The natrolite fluoresces green SW and the calcite fluoresces violet-pink SW. It is 2.1 x 1.4 x 1.3 inches. Calcite from Terlingua, Texas. Terlingua fluoresces light blue SW, pink LW and has a long-lasting phosphoresence. It weighs 10.5 oz and is 4.0 x 4.0 x 2.0 inches. Calcite from Cloford quarry, Mendips, Somerset, England. 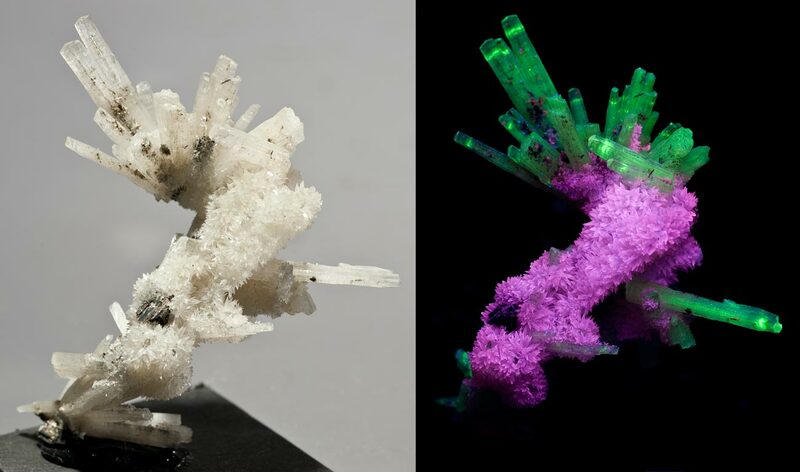 This calcite fluoresces white and red-orange under SW and cream under LW (bottom photo) and has a long-lasting phosphorescence. The piece weighs 5.5 oz. and is 2.8 x 2.0 x 1.5 inches. Willemite and Calcite that were compressed (mylonitized) over millions of years with franklinite from the Nason fault,1250 stope, Sterling Hill mine, NJ. 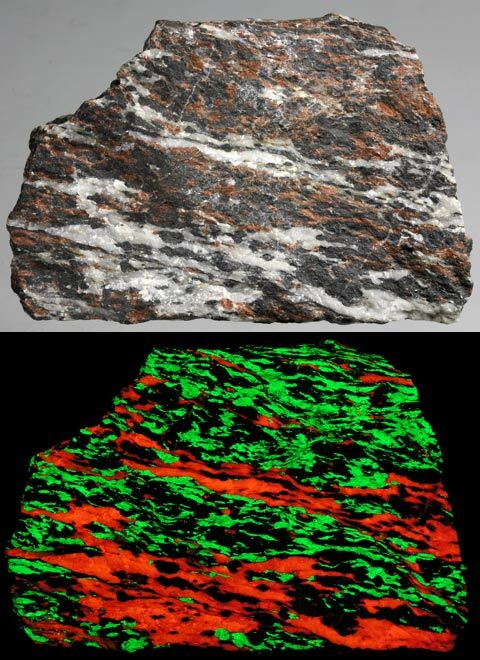 The willemite fluoresces green, the calcite red-orange SW. It weighs 14.0 oz and is 3.8 x 2.5 x 1.3 inches. Calcite from the Christmas Gift mine, Darwin, California. This calcite fluoresces (looks like wollastonite) orange SW. It weighs 3.0 oz and is 3.5 x 2.3 x 1.0 inches. 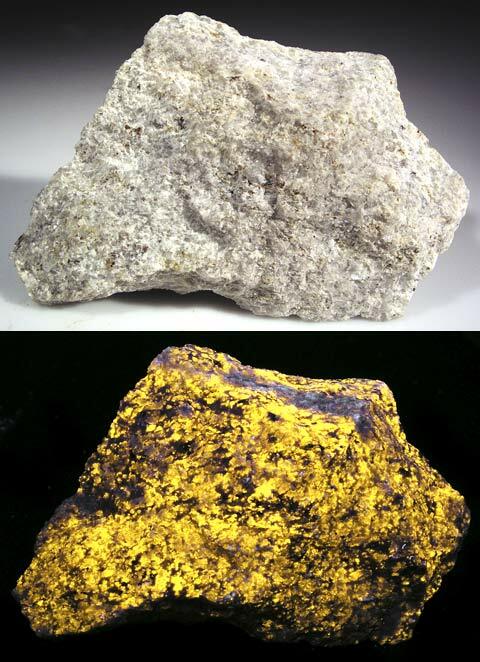 An interesting piece from Karnes Uranium District, Wright-McGrady mine, Texas. 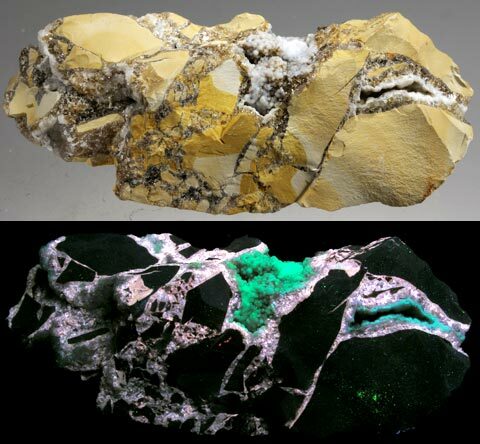 The druzy calcite fluoresces green SW and bluish LW. There are veins of another calcite throughout the piece and they fluoresce peach SW. It weighs 7.5 oz and is 4.5 x 1.5 x 1.3 inches. Crystals of calcite from Joplin, Missouri. 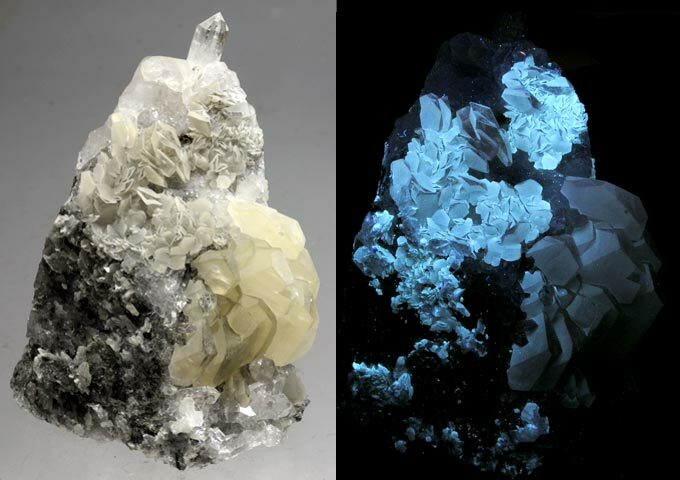 The calcite fluoresces blue-gray. It weighs 4.5 oz. and is 2.5 x 2.0 x 1.5 inches. Beautiful cubic crystals of calcite that have grown on feathery blades of scolecite from Nashik, Maharashtra, India. 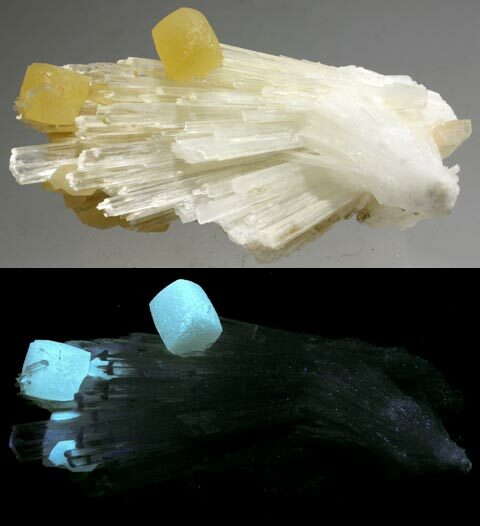 The calcite fluoresces pale green SW and creamy white LW. It weighs 4.0 oz. and is 3.8 x 2.0 x 1.5 inches. From Cochise County, Arizonia this piece has a base of wulfenite with bladed calcite growing on top of it. 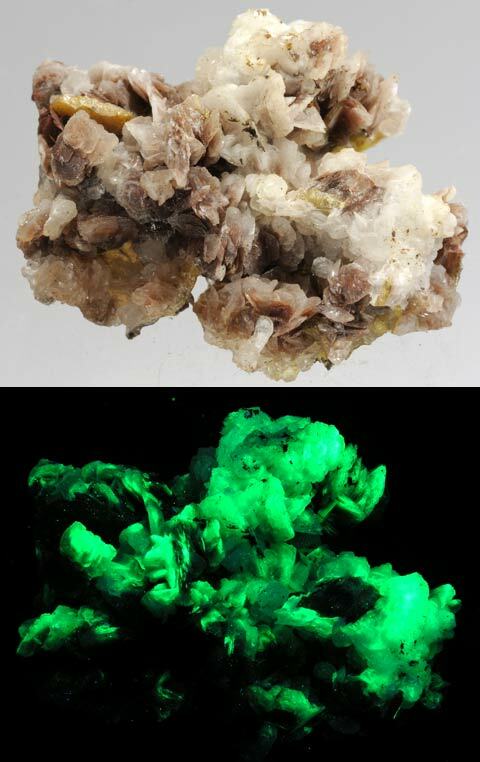 The calcite fluoresces an unusual green SW. It weighs 1.8 oz and is 2.0 x 1.5 x 1.0 inches. Books #3 on Flashlights, Picture Frames & Halley's Comet | Ghosts In The Cemetery| Waffle Recipes| Links Copyright 2008 through 2019 by Stuart Schneider. Do not use any parts of these pages without written permission.